Adams State University has attempted to banish, and now publicly defame, one of its longtime employees and community members. I am not merely an “unsuccessful job applicant” but former faculty at Adams State University for four years, during which time I received very high student evaluations, departmental evaluations, created a video production curriculum, produced over 100 videos for the university’s promotional use, advised a student video production organization, and helped to create a vibrant local film festival for the campus and community. Now ASU administration seems to prefer that I never existed, even while still offering all the courses I developed and displaying the videos I produced all over the university’s website. My job performance and credentials speak for themselves and I am more than qualified as a media production faculty member, as ASU clearly agreed by hiring me for four consecutive years with full knowledge of my body of professional work – which includes a videogame about Columbine amidst over 150 other production credits. My CV is online for anyone to review. There remains broad student, faculty, and staff support for my presence and participation on the university campus, but for the threat of similarly repressive action being taken against them. While teaching on contingent faculty contracts, I applied for a full time position two years in a row and was not named as a finalist in either search even as I performed the job functions of the position daily and with meritorious performance. So after I identified multiple technical, procedural, and factual errors during my job application with the ASU Office of Equal Opportunity in June 2015, ASU began to engage in a retaliatory campaign up to and including banning me from campus and publicly stating that I am engaging in “terrorism” simply for attempting to have my grievances redressed using the university’s own channels of communication. I have repeatedly requested to have the substance of the allegations against me named, with a citation of law or policy ASU alleges that I have violated. Instead, have received in response only hearsay and anonymous statements based not on my actions or behaviors, but rather the imprecise whispers of unnamed persons feeling “threatened” or “annoyed” or “harassed” by my professional and sustained efforts to have my concerns addressed. These statements appear to have been gathered during an investigation in which I was not invited to respond. ASU administration now remains eager to gain my participation in an “appeals” process, run by their own administrators, that presents a clear conflict of interest and requires a pretext of due process which they refuse to, or simply cannot, provide. I have never been cited for any disruptive behavior. I have no criminal record. I have no history of violent conduct. This would all be amusing if it weren’t so patently ridiculous and damaging to the institution and community that I call my own. In their recent email to the ASU campus, The Board of Trustees seems to forget that the First Amendment protects more than freedom of speech; it also protects freedom of assembly. With the actions the administration has taken, ASU has effectively set up a speech-free zone around the perimeter of a public campus and put everyone on notice that they could be next. And again, all without due process or even having made formal allegations known to me. The Board is also mistaken in stating that a Persona Non Grata has been given to me. No such status has been issued. The proposed PNG policy has not yet been approved by the President’s Cabinet and was tabled at second reading on November 9th due to a number of obvious legal concerns. Simply, no such policy yet formally exists at ASU. The Board would do well to inform themselves of the daily activities of the ASU administration prior to issuing such erroneous communications. Now, the Colorado Conference of American Association of University Professors has issued a statement strongly opposing ASU’s treatment of me and the attempt to pass a PNG policy. The other theme that is emerging from the administrative edicts to the campus, by President McClure, Chief of Police Grohowski, and now the Board of Trustees, is the notion that employees should not be engaged in critical thinking about their workplace practices or policies; they should simply do what they’re told and be quiet. ASU administration clearly wants this controversy to go away, they want me to go away, they don’t want to talk about the real issues that would implicate their administrative ineptitude, and they want to make sure that their students, faculty and staff do not talk about it, either. That is also an infringement of free expression and anathema to the purpose of a university. Thus, I have been banned from the Adams State University campus without due process on the basis of some “urgent threat” the university alleges that I pose. Yet no member of law enforcement other than ASU’s own police officials have contacted me to perform even a preliminary investigation or basic threat assessment. Surely if I were actually engaged in “terrorism” as President McClure has claimed in a November 7th Valley Courier article, law enforcement would have investigated this allegation in detail. 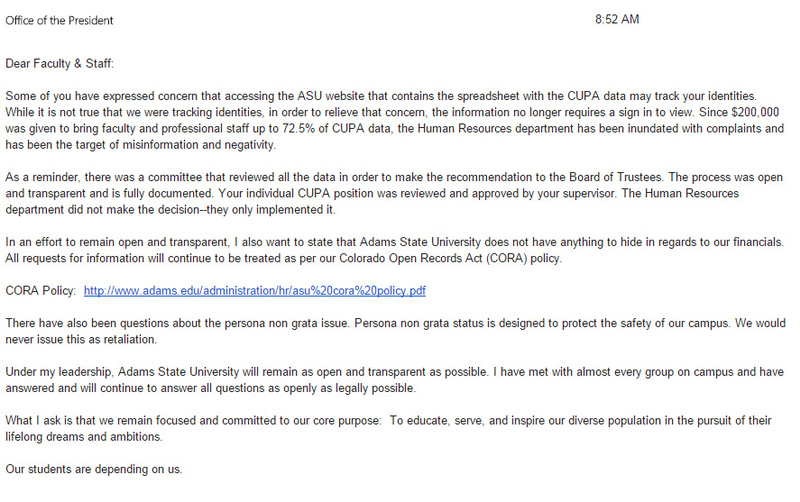 But the ASU administration seems to prefer fabricating their proceedings as they see fit. And it is now becoming evident and widely-known that their actions are either the result of gross incompetence or, more disturbingly, ASU administration is making claims of “campus safety” in bad faith as a means to remove me from campus. In any case, the university persists in making a series of serious mistakes.